“Nothing is impossible the word itself says I’m Possible!” Oh if only our children and students could grasp this concept. This week we are going to talk a bit about how we can encourage our students to dream. Using a growth mindset and the power of possible our students can soar. Many students due to circumstances beyond their control come to us already defeated and limited in their mindsets. They think they can’t possibly do something great and that is where we come in. We have so much possibility sitting before us each year. These individuals that we are blessed to have in our class are our future. Doctors, scientists, inventors, visionaries, leaders, mothers, fathers and so much more. We need to encourage them to dream a little and to show them we believe in them, that we know it is possible! Here are some ways you can encourage your students to dream. Help them discover new things. Explore science, engineering, inventions of all kinds. Check out books and bring them in to encourage children to think outside society “norms” for them. Most of all we can encourage both boys and girls that no field is out of reach for them. If you have a boy who loves teaching encourage him, if you have a girl who loves inventions encourage her. The world is theirs and they can write the pages of story! Consider creating a class journal where students write down what their dreams and have other students leave encouraging notes at the bottom. Talk about your dreams, share with them. Just by virtue of sharing with them they will realize that dreams made today can be shifted, refined and even changed completely and still have a happy ending! Your encouragement in the power of possible will be something they will remember FOREVER. We all have that teacher who inspired us. Why do we fondly remember them? It is because they believed in us and showed us that we had possibility. This book will encourage your students to look beyond circumstances and what others think or say. It shares why a bee shouldn’t be able to fly yet it does! 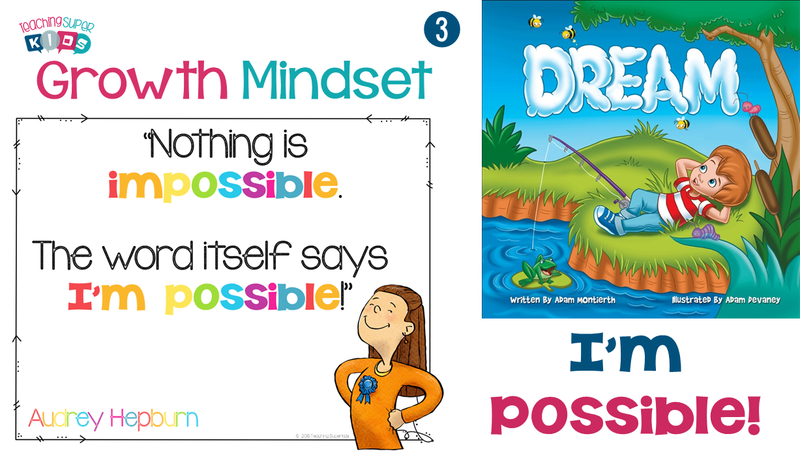 This book challenges children to think outside the box and to dream POSSIBLE dreams. Even when others say it can’t be done hold on to the dream and continue on. Other examples are people from history who achieved dreams as well as other animals.